Bike ride starts Saturday morning, June 22, 11 am at JB’s FISH CAMP, 859 Pompano Ave., New Smyrna Beach, FL 32169. 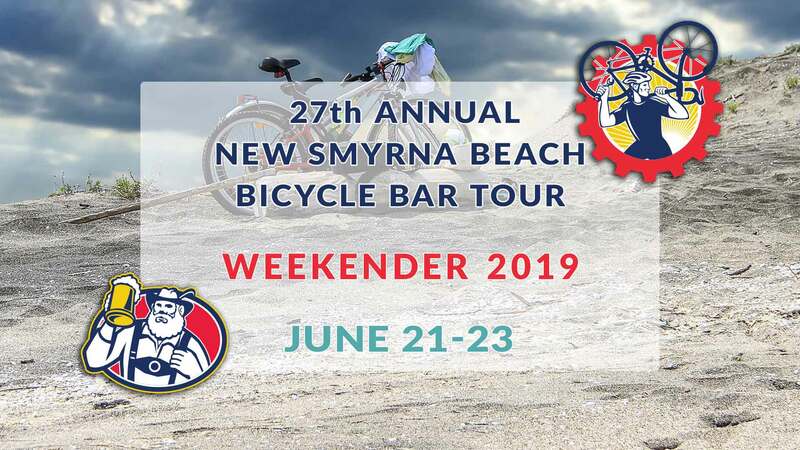 The annual "New Smyrna Beach Bike and Bar Tour" is a long-standing tradition and will take place on June 22nd, 2019. It will be the 27th year and still going strong! It started out with 2 bike riders on the first tour and it has grown over the years to over 3500! Stops on the tour include, but are not limited to, J.B's Fish Camp, Moe's, Chase's, Sea Vista, NSB Sea Shack, Beachside Tavern, Off the Hook, Buzzard's Beach, Clancy's Cantina, Tayton O'Brian's, Flagler Tavern, The Breakers, Crow's Nest, Ocean Breeze and Peanuts. We arrive Friday afternoon and check into our unit. There is ONLY ONE PARKING PASS PER CONDO so carpooling is highly recommended. Some of you (myself included) will have to unload our stuff & bicycle in front first, then park our car on a nearby street. I have done this many times, with no problems. Some folks arrive later but early arrivals will likely be at the pool. We will have a group going to The Garlic Restaurant for dinner. You will be asked to RSVP for that. Later we head to Flagler Ave. for dancing at one of the local clubs, usually Flagler Tavern as they always have an awesome band. Stay out as late as you wish but remember tomorrow’s activities. It's going to be HOT! Plan accordingly! No need to get up super early but many do so and do a light breakfast or walk the beach. But by 9:30 am we need to be bicycling south to cover the 7 miles to JB’s Fish Camp for the start of the Bicycle Bar Tour. JB’s is the southernmost part of the ride meaning all stops after that will be back in the opposite (north) direction. It’s important to be at JB’s early so that you can adjust your bicycle, hydrate, maybe down your first libation, AND grab your T-shirt if you ordered one in advance. Just before departure at 11:30 am there is a HUGE group photo opportunity. IF you do NOT feel up to going all the way to JB’s then consider meeting us at MOE’s by Dollar General Market about half way. There will likely be a commemorative T-shirt available, but you will have to inquire directly through the above link. After leaving JB’s our first stop is MOE’s (see above). Our second stop is Chase’s On The Beach, one of my favorites. Chase’s has a pool where volleyball is played non-stop. Access to the pool may require a modest fee & wristband indicating you are over 21. There is usually a DJ or live music and a poolside bar allows you to keep your beverage in the pool with you! If you do that watch out for the flying volleyball! IF it is TOO CROWDED I will press on to the next stop. Other stops named above continue north along the beach, then through the Publix Plaza, then through back roads to Flagler Ave. for the last few stops including Clancy’s Cantina, Flagler Tavern, Breakers, more, and Peanut’s where the event formally ends about sundown. This event goes on all day. After folks leave MOE’s the groups spread out considerably. Some folks do the first few stops, drop by the condo for a rest, then rejoin the group later. With Flagler Ave. being only a block from Oceania you can leave your bicycle there and walk the last few stops. There is NO obligation to visit any or all of the stops and imbibing is NOT required! Be mindful of your condition, look out for other vehicles, pedal responsibly, and HAVE FUN! AFFORDABLE WEEKENDER OPTION: Arrive Friday OCEANIA BEACH CLUB (near end of Saturday’s bike route). PARTY! Next morning bicycle to JB's. Spend the rest of the day following 1,000+ party animals bar to bar. Sleep at Oceania again that night too. 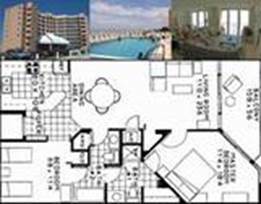 5 CONDOS RESERVED! COST per person TOTAL FOR BOTH NIGHTS: 2 people in Master Bedroom - $240 for entire room (Private BATH!) 2 people in 2nd bedroom (2 twin beds) - $220 ($110 per person) 1 person on living room couch pays - $95 They may hit your credit card for incidentals at check-in so be prepared. LIMITED PARKING: ONLY ONE (1) CAR PER CONDO! NO LAST MINUTE GUESTS! These are the ONLY units I am booking this year! No others will be booked by me. First come – first reserved!